Ever wondered how many popular songs there are with lists in the lyrics? Once you start looking for them, you’ll find them everywhere. 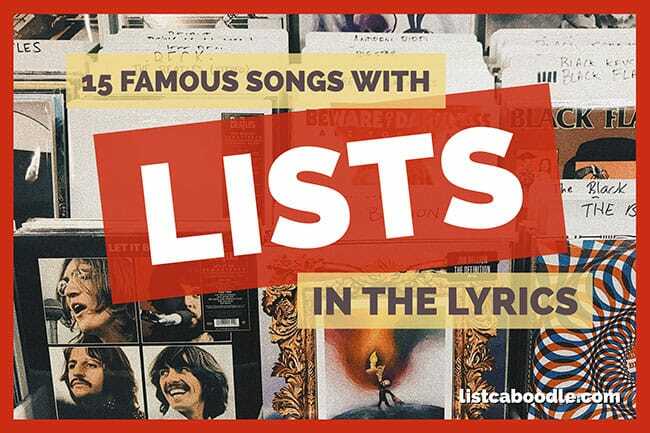 We’ve assembled 15 of the most famous “list” songs here. They range in style and age, but all have one thing in common: the list. And if you find yourself hungry for more, see below for our list of “Songs with lists in the lyrics, from A to Z”. Some artists provide lengthy lists of places and names, while others make only a short reference to a list in their songs. Give a listen to each of these popular tunes and see how each artist uses the listing technique to give a unique twist to their hit songs. Both Hank Snow and Johnny Cash made I’ve Been Everywhere a country music hit. Originally of Australian origin, the American version of the song lists over 90 locations the singer has visited. Versions of the song have been adapted for audiences in Great Britain, New Zealand and Ireland. It is said the iconic Beach Boys song California Girls was conceived when Brian Wilson first tried LSD. The song’s lyrics ponder the different qualities of girls around the world from a California teenager’s perspective. The 1965 recording helped define the California Sound. Check out the beaches in Phuket, Thailand. This famous “list song” is Paul Simon’s only number one hit on the Billboard Hot 100 as a solo artist. Simon recorded the cheeky tune after divorcing his first wife. Madonna released the dance hit Vogue on her 1990 album I’m Breathless. In the song, she lists various celebrities from the golden era of Hollywood. The song introduced “Vogueing” to the dance scene and became the world’s best selling single that year. Bob Dylan created an innovative “music video”—before there was such a thing—for Subterranean Homesick Blues in D. A. Pennebaker’s documentary film Dont Look Back. While the song plays, Dylan holds up cards that match the quick pace of the lyrics. Some of the cards show intentional spelling errors and puns, as Dylan presents them with deadpan expression. The breakthrough video was inspiration for many future MTV musicians. 6. It’s the End of the World as We Know It (And I Feel Fine) by R.E.M. The popular R.E.M. tune follows very closely in the tradition of Bob Dylan’s Subterranean Homesick Blues. The rapid-fire stream-of-consciousness lyrics list a wide range of references. “The words come from everywhere,” explained the band’s frontman Michael Stipe. The traditional English Christmas carol lists the gifts received by “my true love” on each of the twelve days of Christmas. The song is believed to have origins in France, while the first published account of the song dates to 1780. The signature Motown song by Martha and the Vandellas burst on to the scene in 1964 and rose to No. 2 on the Billboard Hot 100. Since then, musical artists like the Momas & the Papas, Van Halen, David Bowie/Mick Jagger, and others have recorded covers of the song to the delight of many generations of fans. Johnny Cash’s hit single about sneaking parts out of a General Motors assembly line hit number one on the Billboard Hot Country Singles chart in 1976. The novelty song ends with Johnny describing his misfit Cadillac by listing the years of all the parts that made up the car. Billy Joel lists over 100 headline events and names in the lyrics of his 1989 hit song, We Didn’t Start the Fire. The avowed “history nut” lists the important world events—ranging from the date of his birth in 1949 to the time of the song’s writing—in rapid-fire fashion. In the song Travelin’ Man, television star and 1950s teen idol Ricky Nelson lists the women he loves around the world. The 1961 hit single soared to No. 1 on the Billboard Hot 100 while its b-side, Hello Mary Lou, reached No. 9. The classic Rodgers and Hammerstein musical The Sound of Music features Julie Andrews singing the show tune My Favorite Things. Playing the role of Maria, she sings about the things she loves and thinks about when times are bad. The lyrics to (Get Your Kicks on) Route 66 list many of the major stops along the famous highway. In Chuck Berry’s version of the song, he famously mispronounces “Barstow” but musically holds true to the song’s R&B roots. John Lennon and Paul McCartney wrote Come Together as the opening track for the album Abbey Road, ranked by some fans and critics as the best Beatles album ever made. Lennon described the nonsensical lyrics of the song as “gobbledygook”. The popular Disney film The Little Mermaid features the hit song Under the Sea. The crab Sebastian, sung by Samuel E. Wright, tries to convince Ariel to stay underwater with a long list of all the animals and friends she has down there. DJ Bombay by Michael V.
Farming from Let’s Face It! Let’s Not Talk About Love from Let’s Face It! Rhode Island Is Famous For You from Inside U.S.A.
Sinaktan mo ang puso ko by Michael V.